Ultimate sensitivity, Rugged, high-impact ABS case with reinforced coil compartment, Adjustable sensitivity knob. Rechargeable. (1). Ultimate sensitivity: detects medium sized pistol from 9" distance; large knife from 6"; razor blades and box cutters from 3" distance; foil-wraped drugs and tiny jewelry from 1". (2). Self-calibrating: digital microprocessor technology eliminates the need for periodic sensitivity adjustments. (3). Rugged, high-impact ABS case with reinforced coil compartment. (4). Large 10" scan suface for quick, thorough scanning. (5). No tools required to change standard 9V battery. Optional rechargeable battery kit available. (6). 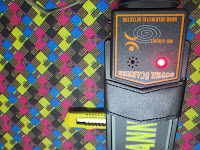 Sharp audible alarm and bright red LED light and viberation indicates the detection of metal. (7). Color LED indication: Green LED power ON indicator; Red LED LOW BATTERY indicator; Red LED ALARM indicator; Green LED RECHARGING indicator. (7). Single 9 volt battery provides up to 60 hours of normal operation. Optional NiMH rechargeable battery provides up to 20 hours on each 12-hour recharge.